The first of three core rulebooks for the 4th Edition Dungeons & Dragons Roleplaying Game. The Player’s Handbook presents the official Dungeons & Dragons Roleplaying Game rules as well as everything a player needs to create D&D characters worthy of song and legend: new character races, base classes, paragon paths, epic destinies, powers, magic items, weapons, armor, and much more. Core Rulebook: The Player’s Handbook is the first of three core rulebooks required to play the 4th Edition Dungeons & Dragons Roleplaying Game. Quick and easy play: The improved page layout and presentation enables new and established players to understand and learn the 4th Edition D&D rules quickly. D&D Insider: The Player’s Handbook will receive enhanced online support at www.dndinsider.com. Dungeons and Dragons 4th edition doesn’t feel a whole lot like Dungeons and Dragons. It’s not a bad edition, it’s just different. Wizards of the Coast are doing all that they can to attract new players, especially from video game RPG and MMORPG circles. And 4th edition is the best way to do that. It creates a “I console/pc game, but I’ve never table-topped game” friendly atmosphere. The proof is in the 4th edition Player’s Handbook. In this book, D&D is presented in a format built a lot like a MMORPG. You have your race and class as normal, but powers and feats look a lot more like video game power descriptions. They play more like them too. This means classes are more specific to the D&D thought of what the class should be. It’s less flexible, but presented much easier than ever before. Is this a bad thing? I don’t think so, but it’s quite different than D&D 3 ed. To any gamer out there looking to get into D&D, start here. Buy this book and get a group together and start playing. Once you’ve played for awhile and start to feel that urge to make more unique and dynamic characters, buy the 3 and 3.5 books, you’ll never leave them. I started D&D when I was in middle school. That was when 3.0 was still kind of new. It was more accessible than AD&D/2nd, and 3.5 was a good improvement on what already existed. So how does 4th compare? It depends on how used to things you are. Dungeons and Dragons is a role-playing game about adventuring heroes (or villains, depending on your tastes). Think Lord of the Rings type stuff. You pick a race, a class, assign skill points to whatever skills are available to you, pick “feats” (special things you can do) and join a group of adventurers for a quest. I grew up with humans, elves, half-orcs and gnomes. All of those races were down to Earth. 4th introduces races that have incredible abilities straight from level one, with some characters starting the game able to breathe fire or even teleport. Classes have tiered combat abilities that seemed overpowered compared to 3.5. On top of that, the person that introduced me to 4th said that there were abilities you were only supposed to use for “boss” characters. This did not sound like D&D, and it felt too much like a video game on paper for me. To be fair, Wizards of the Coast addressed the problems with 3.5’s overcomplicated combat rules. The combat is more streamlined, and does move a little more quickly. That being said, it is very reliant on picking techniques and moves. I felt like my characters were Pokemon. It turns out several monsters have their own special moves, so I guess it sort of evens things out. Even still, it seems like adventures would become structured around when people would expect to use their one-shot abilities, and this struck me as something that would take the mystery and adventure out of roleplaying. You have to allow DMs and players to establish their own pace, and it seems the options are limited here. 4th edition was marketed as being different from what D&D had done before. It is so different that there was, to my knowledge, no conversion method for making 3rd ed. characters into 4th ed. characters. I question why they didn’t release 4th as a different title. It is too different to feel like a proper D&D edition- you could always convert before. It isn’t that its bad per se, its just…a different game. Full disclosure, I only played 4th a few times, so I could be wrong. This is just my impression from what I saw. The good news is that the set up, while alien to veteran D&D players, is user friendly for newcomers. If you are just starting out, and most of what you know from RPGs comes from video games, this well be a good game for you to try. The rules are easier to understand. The races and classes are definitely flashier and more interesting than the more mundane choices from earlier editions. You don’t necessarily overpower monsters too easily, but you do look like a superhero. Its a unique aspect of 4th edition. My understanding is that Pathfinder is more like what established D&D gamers are looking for these days. Personally, I’ll stick with 3.5 for now, assuming I get back into regular roleplaying. When it comes to Dungeons and Dragons, I tend to prefer 1st or 2nd Edition, so that is a big part of how I feel about the changes in 4th. Past those, Pathfinder seems to be doing a good job at keeping the spirit of 3rd alive and I’m already excited to play 5th. That leaves this edition as the black sheep of the family, the one I’m okay with skipping. Will I play it? Sure, I never turn down a game with friends. Will I buy it? Not likely. Now this is the real question. 4th Edition is definitely for people who want to get the most out of their miniatures, because the combat is highly grid based. That also makes it ideal for people playing online with sites like Roll20. Since the powers work like video game abilities, those who want to move from one to other will enjoy it to, especially if you’ve played the MMO Neverwinter game. For the rest of us? Maybe not so much. I don’t enjoy relying on grids and I miss having magic feel like magic and not some clickable superpower. This is probably going to be the black sheep of D&D for a while, not replacing those that came before or holding up against 5th Edition and beyond. I have a friend who loves this edition, but the majority of those I talk to are moving on. Why is it NOT in My Collection? It’s trying too hard to be something I can get elsewhere. If I want simpler game play, I’ll choose 1st Edition or another game entirely, like Savage Worlds. If I want grid combat, there games that focus just on that. I don’t even feel the spirit of D&D in this game. I’ll never turn down a game a friend is running, but I’ll always hope he’s using a different system. More than likely, I’ll be picking Pathfinder or 5th Edition as my next big role playing purchase. I still remember when this book first arrived at my house on release day. I have still never been as excited about a player’s guide for any RPG as for this one. Though, yes, D&D does have its flaws, I think that this book in particular was a great leap forward. I must have made a dozen characters before even playing in more than 1 campaign. The races have a small description of fluff that helps, and the racial abilities are fun. I love even now to create atypical race-class combos, which is not totally harmful to your power level to do. The classes all have their moments to shine. The balance of them is good, and the fact that they openly explain their roles makes it easy to help a new player make the right character. The powers section is just fun to read through once you know how the rules work. Powers really make combat fun and not just a “I attack with my sword”, instead you have lots of options. I do wish that they had more non-combat powers, but there is always room to grow. Paragon and epic destinies are enjoyable to imagine, and it really does help to make a big difference in the feel of the scales between the different tiers of play. The magic items system is not my favorite, but it is simple enough. 4ed doesn’t have to lose the roleplaying feel of olderversions of DnD, you just have to game outside of the books a little more. What it brings to the table is a really detailed game of miniature combat designed to be played on a grid. It throws in rules for progressing in levels and adventuring outside of the combat area, but you need a good DM to keep the story going. I know a lot of people like to stick with the older editions, and that’s ok too. This one is for people that want to roleplay AND have mini combat, which I enjoy. The debate about DnD 4e has raged long and hard since it was announced. I think the biggest issue is that is attempts to level the playing field between character classes and it makes magic much more common place by giving all character classes special abilities. It is very much more geared to combat using the collectible minis than previous editions and it feels a lot more like an MMO with all the abilities that have cool down times. I guess it is great for playing in game stores and the like where the aim is to sell minis and splat books but for friends roleplaying around a table and trying to actually get into characters and tell stories this might be a little rules heavy. I run a website for RPG games and the great majority of users have tried 4e and either returned to 3.5 or now play Pathfinder instead as there is less concentration on the rules and more concentration on the story. This edition of D&D has led to more discussion in our group than any other edition of the game. Our group ended up split on 4.0, which ultimately ended up killing our campaign. We are trying to revive D&D in our group, with lots of difficulty. Part of our group hates the fact that 4.0 changed the game into a miniature game and violated the old school creativity. The other part of our group likes the fact that fighters/warriors etc., have multiple options and combat is fluid resulting in new options for all characters and a constantly evolving battle field. This discussion could go on forever, but I will leave this review with those two very different views of the system. 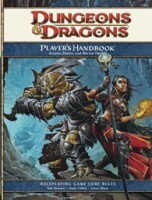 Add a Review for "Dungeons & Dragons (4ed): Player’s Handbook"